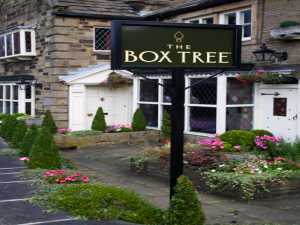 Box Tree Restaurant01943 608484work Restaurant - FrenchThis small renowned restaurant has been apart of Ilkley for the past 40 years. Now owned by Husband and Wife team Simon and Rena Gueller, the Box Tree continues to aim to be the best. The modern French classical menu and extensive wine cellar offer food lovers an unforgettable experience. Simon’s commitment to the best, freshest ingredients, with an emphasis on local suppliers, farmers and growers, will entice food lovers with favourites such as Roast Scallops with Truffle Oil, and Chocolate Mousse with Red Berries. The Box Tree represents a combination of 21st century efficiency and exquisite good taste. Whilst the kitchens boast the latest equipment, the restaurant features a collection of art and antiques which define the style and luxury for which the Box Tree is famed. We look forward to welcoming you to the Box Tree. We are open Tuesday - Saturday for dinner, and Friday, Saturday and Sunday lunch. For more information & reservations, please call 01943 608484. This small renowned restaurant has been apart of Ilkley for the past 40 years. Now owned by Husband and Wife team Simon and Rena Gueller, the Box Tree continues to aim to be the best.